The name Akanksha will ring a bell for everyone who has interacted with little kids clad in yellow and orange t-shirts with the foundation’s ‘sun’ logo on them (or those who’ve volunteered at the organisation for extra credits in college). Taking the educational NGO’s idea further, entrepreneur Shaheen Mistri founded Teach for India. This non-fiction book illustrates her journey, starting with how an encounter with Pinky, a child from the slums, changed her life forever. An engaging read, the story of Shaheen’s endevour is interspersed with poems, stories and personal experiences by Teach for India alumni and students. 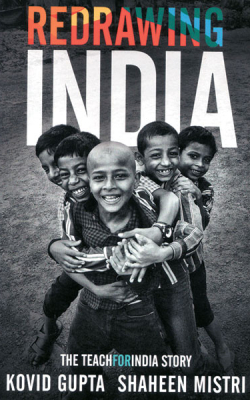 Redrawing India inspires one to think about the greater cause of education, and what it can do for the children of our country and their future. Most people are familiar with the Ramayana and the Mahabharata, but this book delves deeper into the stories and analyses their characters. Whether it is Kunti’s motherly instincts, Karna’s greatness or Sita’s struggles ­­­­— psychology has an answer to everything. Through these mythological characters, the book explores femininity and its changes over time. For students, psychologists, or anyone who’d like to read a take on the psychology of Indian women, Imhasly-Gandhy’s non-fiction tome is a good choice. 316 BC involving Alexander the Great’s generals, the novel has everyone from the ancient Greek ruler to modern day Indian intelligence agencies trying to discover the Mahabharata secret. Using the epic as a base for the thriller, this page-turner will surely appeal to fans of mystery books. “The things we ache to hear often remain unsaid.” Thoughts like this make Anupa Mehta’s collection of short stories a pleasant read. Containing nine stories, each of which brings out aspects of human feelings and behaviour, the book is good for a lazy Sunday – the language is simple, and one can devour the entire volume from cover to cover in a few hours. Pick this up for its engaging style, and to explore human emotions of love, loss, belonging, happiness and desire.